Description: Designed with a curvaceous profile that fits into luxury homes, hotels and other commercial and hospitality locations. This elegant ceiling fixtures defines a distinctive sophisticated aesthetic. 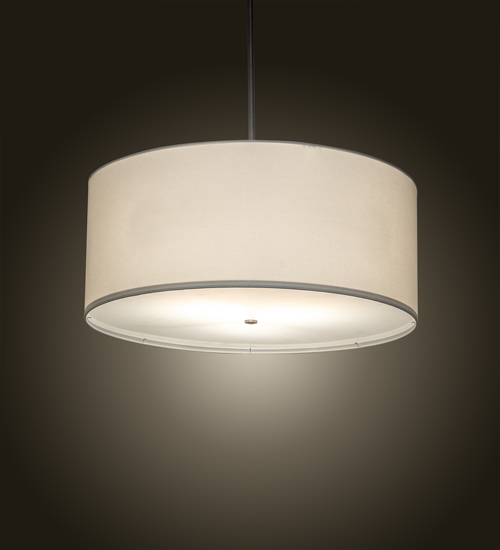 The White Textrene shade is enhanced with a Statuario Idalight bottom diffuser. The shade complemented with hardware featured in a Brushed Nickel powder coat finish. Custom crafted by highly skilled artisans in our 180,000 square foot manufacturing facility in Yorkville, NY. Custom sizes, finishes and diffuser colors available. UL and cUL listed for dry and damp locations however we do not recommend installing it in spaces that experience a large amount of moisture due to the fabric shade.